Whether you're country music's biggest fan or the occasional honky tonk achey-breaky toe-tapper, you probably dig Carrie Underwood. Of country music's biggest stars, she's got some of the best crossover appeal. I unabashedly adore Nashville, and think Miranda Lambert is as cool as they come, but that's about the extent of my country music adoration, except when it comes to America's Sweetheart Carrie Underwood. Not only does her music keep getting better, she's continuously approachable, classy, and straightforward when she's not onstage, and I admire her all the more for it. The American Idol winner has a brand new album Storyteller on the way and Underwood released the Storyteller album cover on her Instagram account on Tuesday. It's definitely the most country-looking of all of her albums, and it may be proof that she's doing the opposite of Taylor Swift — going deeper into country and a little further away from pop. 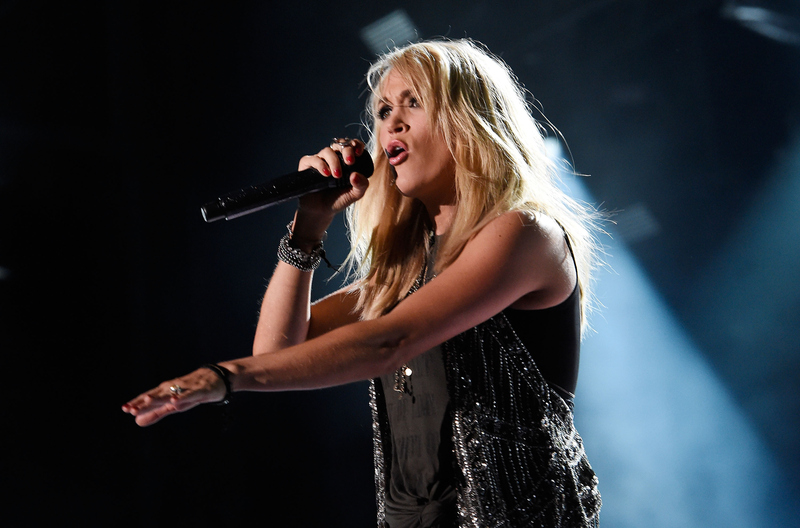 Carrie Underwood, like all of us, has an inner Homer Simpson that says, "Dont you hate pants?" She gets us, she really does. Straightening iron-schmaightening iron, I say! As someone with natural frizz, curls, and flyaways, I love any celeb who celebrates messy hair. It's Time For Over-Sized Flowy Tops, Y'All! I'm a little over this whole excessive back sweat season. I am ready for ridiculously oversized blouses, chunky sweaters, and pants (IF I MUST) with elastic waistbands. Get it, Carrie. I'm at a point in my life where I don't want to go to a concert if I can't sit down between sets. I hate bars without seats. People with standing desks confuse and frighten me. Carrie Underwood is pro-sitting, and therefore I am pro-Carrie. See a pair of embellished cowboy boots you want, but not sure you can pull off? DO AS CARRIE DOES AND ROCK THE HELL OUT OF THEM. I'm not talking sh*t stomping "Run the World" Bey. I mean the etherial, spiritual wonder that makes you want to dance ballet in your underwear. Carrie Underwood has used this effect with incredible precision. I see it, and I think, "She glows, she is a wonder, she is a force of female light and energy." Go onward and give your soul the halo effect. Carrie Underwood has always been a country star, though her previous album covers would have you think she's more in line with Britney Spears than Faith Hill. Storyteller looks like she's fully embraced the country crown, and it looks damn good on her. If I wasn't already a fan, this cover alone would convert me.